From many delicious Vietnamese Food Recipes, you can not skip this dish. It is Grilled Chicken with Honey and Rice (Cơm Gà Nướng Mật Ong). Eating boile rice is necessary in every single meal of Vietnamese families. Here is the great combination between grilled chickne, vegetables and boiled rice. Its flavor is really amazing. You can cook it on weekends for your family and friends. I bet they will fall in love with it. I do not know the first time when I ate it. However, when I remember its flavor, honestly I cannot stop my drool. With this dish, it requires much time for cooking. If you love to create one special meal for your beloved family and friends, I think you should try. Please follow our instructions below to process one of amazing Vietnamese Food Recipes. For boiled rice: 2 bowls rice, 2 bowl chicken broth, 3 cloves garlic, 1 teaspoon saffron flour. 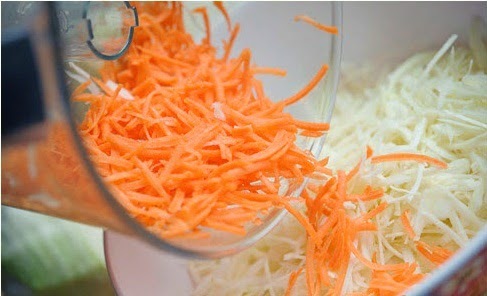 From mixture vegetables: ½ cabbage (400 – 500gr), 1 carrot, Vietnamese Mint, Spices: salt, sugar, pepper, fish sauce, lemon fruit. Step 1: Grilling chicken: Scrape salt around chicken thighs, then clean with water 2 – 3 times. Wait to dry. Marinate with salt + pepper + minced garlic. Wait about 2 – 3 hours (If you want it more delicious, you can wait 1 night). Step 2: Melt butter, mix it with honey and then scrape on chicken thighs. Wait about 10 minutes. Set up grilling oven at 200 degree, put chicken thighs into and grill about 20 minutes (Use below and above heat). Then, pull the tray out, conitnue scrape more butter and honey mixture on face and bring to grill again. 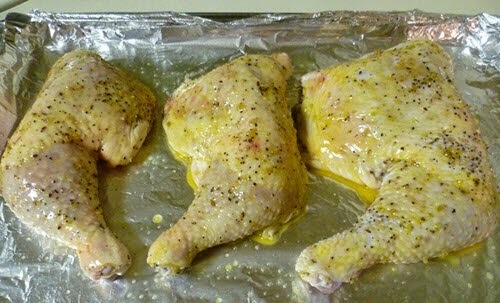 Total for grilling time Is 40 – 45 minutes (It depedns on small or big thighs). Step 3: Slice small cabbage, then bring to clean and wait to dry. Add 1 tablespoon sugar + 1 teaspoon salt on sliced cabbage, mix well, wait awhile until cabbage become softer and pour out water. Peel of the cover of carrot, slice small and thinly, marinate with a little sugar. Clean Vietnamese Mint, slice small. 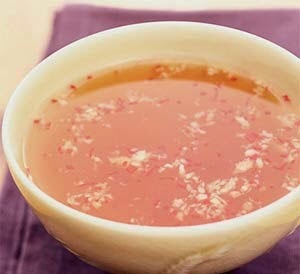 Step 4: Dipping sauce: 2 tablespoons fish sauce + 2 tablespoons sugar + ½ lemon juice mix together and stir well. If you love spicy, you can add more sliced chili. Here is the important step to increase the flavor one of amazing Vietnamese Food Recipes like this dish. Step 5: Squeeze cabbage and carrot to less water, add to bowl, pour dipping sauce (in step 4) and mix well. Next, add sliced vietnamese mint + pepper into bowl, season again to suit your flavor. It requires a litle sour, a little sweet and salty. 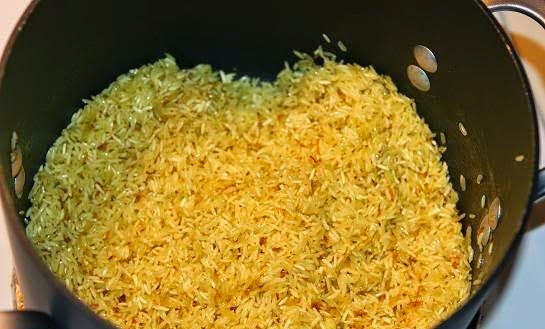 Step 6: Cooking rice: Clean rice 2 – 3 time and soak into water about 30 minutes. Peel of the cover of garlic, and mince. Boil the chicken broth. Add 1 tablespoon oil on pot, wait to heat, add minced garlic and fry until it is fragrant. Next, add saffron flour into pot, stir well. Then, pour rice and fry about 5 minutes. Next, pour chicken broth into pot. The lever of broth is more than rice’s one. (1cm). Stir well and wait to boil about 1 minute with medium heat. Then, reduce to small heat, cover the pot and cook until rice is soft. Remember, sometimes you should open the lid, stir regularly to make sure rice is cooked all. Finally, you finished one of stunning Vietnamese Food Recipes. 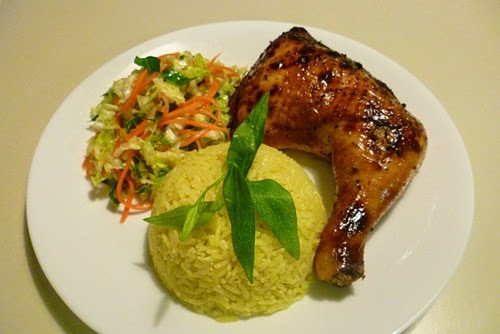 Scoop boiled rice on plate, serve with mixutre vegetable (in step 5) + grilled chicken (in step 2) will bring a spectacular amazing for you and your beloved family. Be ready to make this dish and make the relationship between all members in family more happy. Hope you like this recipe and Good Luck for your Cooking.